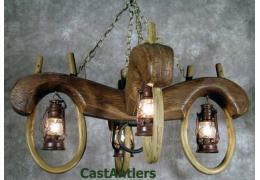 The Reproduction Double Ox Yoke 4 lantern light brings the unique spirit of the wild west to your .. Inspired by mountain luxe trends, the transitional Bluffton Collection has a perforated screen shade..
Dimensions: W 27" x H 30.25" Bulb Type: Candelabra Bulbs Number of Bulbs: 5 Wattage: 60W Chain Len.. Measures 33.25" L, 18.75" W and 30.25" tall, uses 6 40-watt candelabra lights (not included).&..
Dimensions: W 26.5" x H 25.5" Glass: Brushed Amber Glass Bulb Type: Medium Base Number of.. 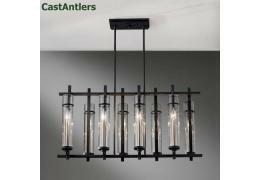 Measures 37.5" D and 29.75" H, uses 8 60-watt candelabra lights (not included) Forged iron/brushed s.. Combinations available: Bear/Pine Trees, Moose/Pine Trees, Deer/Pine Trees, Pine trees Fixture Ty..
Dimensions: W 36.5" x H 41.5" Glass: Brushed Amber Glass Bulb Type: Medium Base Number of Bulbs: ..
Dimensions: W 46" x H 53.5" Glass: Brushed Amber Glass Bulb Type: Medium Base Number of Bulbs: 16 W..